The Australian Cattle dog was bred in the 1800s by Australians to create a working cattle dog that could handle the harsh climate of Australia. 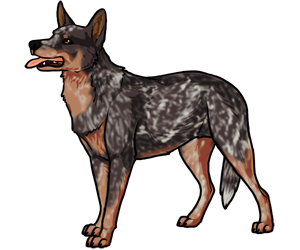 The Cattle dog was bred from a cross between dingo-blue merle collies, dalmations, and black and tan kelpies. The result was a dingo-looking dog with an amazing will to work and almost unsurpassable drive. Today, the Australian Cattle dog serves as herding, guard, agility, and competitive obedience dog. The Australian Cattle dog goes by several different names including Australian Heeler, Hall's Heeler, Queensland Heeler, Blue Heeler, and Australischer Treibhund. 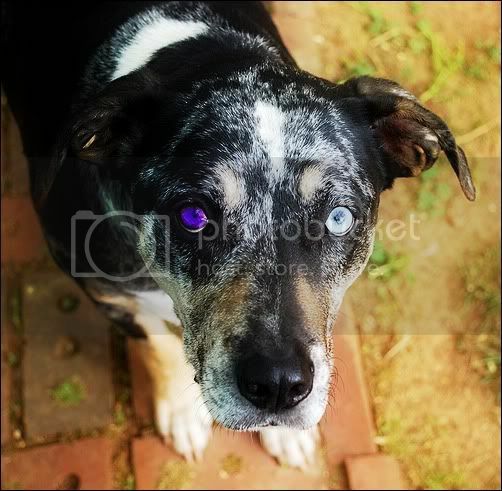 Merle-colored ACDs are prone to deafness.